Reading and Writing Redhead: Primary Teacherhood's Great Giveaway! 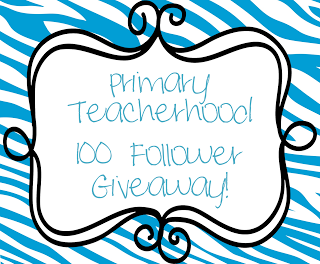 Ashley at Primary Teacherhood is having a terrific 100 follower giveaway! Congrats, girl! It goes live tomorrow and you can win a bunch =of great stuff including one of my bestselling products! Click on the pic above to head over and enter ! Vacation is Over but it's Freebie Time! New Cause and Effect Freebie! Guest Post at Really Good Stuff is Live! Blowout Blizzard Sale ! Everything 50% Off! 100!!!!! And not the Day of School! What a Weekend - Sale and a New Giveaway!